Frozen Christmas PuddingA cold version of an old classic! This showstopping dessert will keep your family and friends happy. What could be better, right? Great to be served on our usual hot Christmas days, this heavenly frozen Christmas Pudding is an impressive dessert. Looks classy and tastes divine! This showstopping dessert will keep your family and friends happy. What could be better, right? Great to be served on our usual hot Christmas days, this heavenly frozen Christmas Pudding is an impressive dessert. Looks classy and tastes divine! Mix ingredients together in ice cream maker until thick and just set. If you don't have an ice cream maker you can mix all ingredients together in a bowl then set in freezer for 1 hour until just set. Grease pudding tin with butter and line with cling wrap. The butter will make the cling wrap stick to the tin and this means you can remove the pudding with ease once frozen. Now spread the vanilla semi frozen custard around the base and pushing it up the sides to evenly coat the pudding tin. Freeze for 1 hour while you prepare the chocolate centre. Mix chocolate custard, vanilla ice cream and cream in ice cream maker until thick and just set. Again if you don't have an ice cream maker you can mix all ingredients together in a bowl then set in freezer for 1 hour until just set. Fold in fruit cake and nuts, pour into pudding tin lined with frozen vanilla custard. Cover with cling wrap and set in freezer for 4 hours or overnight. To remove pudding, invert tin onto chopping board and place a hot teatowel around pudding tin for a minute. Turn upright and hold pudding tin sides firm and pull cling wrap up to remove pudding. Place a serving plate on flat base and invert onto serving base, peel off cling wrap and decorate. To decorate, pour melted chocolate or choc top hard setting topping over the top off frozen pudding then add raspberries and mint leaves. 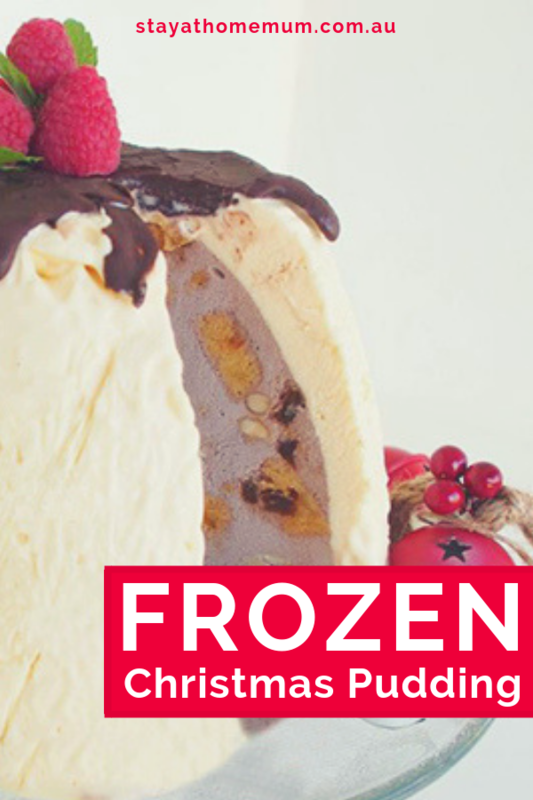 Frozen Christmas Pudding can be kept in the freezer for up to 3 months, so this one is great to make in advance.